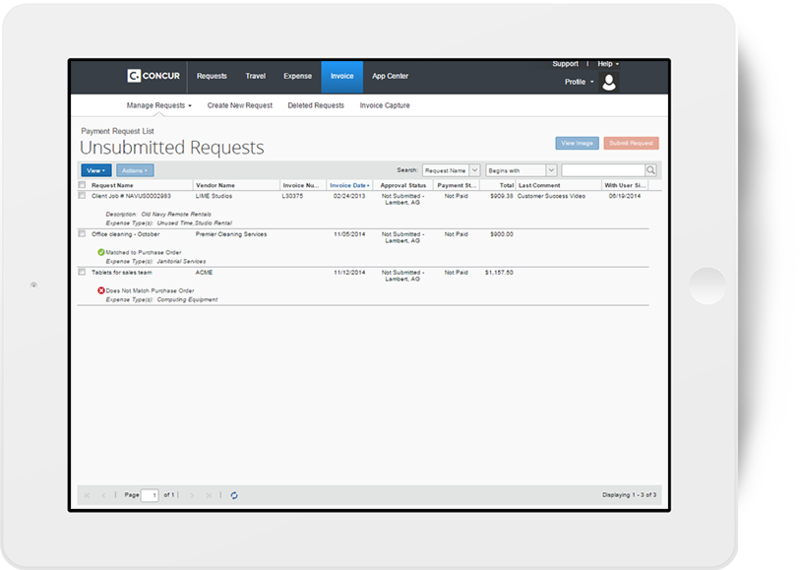 Fast, accurate supplier invoice matching helps you streamline your accounts payable process. 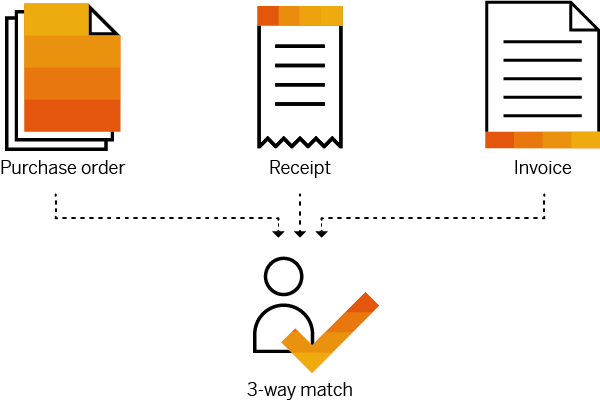 One of the most time-consuming tasks in the invoice matching process is clearing exceptions when there are discrepancies between purchase orders, invoices, and/or receipts. When Concur Invoice finds an exception, it automatically sends it to the relevant team member, so they can clear it. 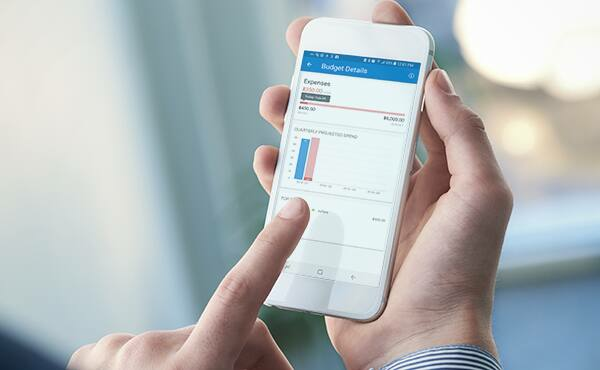 And Concur Invoice is mobile-friendly, so staff can handle the task on the go. Invoices that take weeks to clear can make strategic spending decisions more difficult. By minimizing manual tasks with automated accounts payable three-way match and speeding up the invoice process, you’ll get a more accurate and timely view of cash flow, avoid late fees, and take advantage of early payment discounts. Your spending and invoice policy may be watertight, but it only works if it’s followed consistently. When supplier invoice and purchase order matching is managed with workflows that automatically send approvals to the right team members, you can ensure your policy is working as you designed it, while reducing your vulnerability to fraud. In fact, some organizations using Concur Invoice reached 100% compliance. While it’s good practice to make sure you’re checking all the documents relevant to a purchase, manually matching invoices to purchase orders and receipts is a long and often error-prone process. Automation reduces the risk of errors and frees your team to tackle more strategic projects. It can also improve morale and productivity. 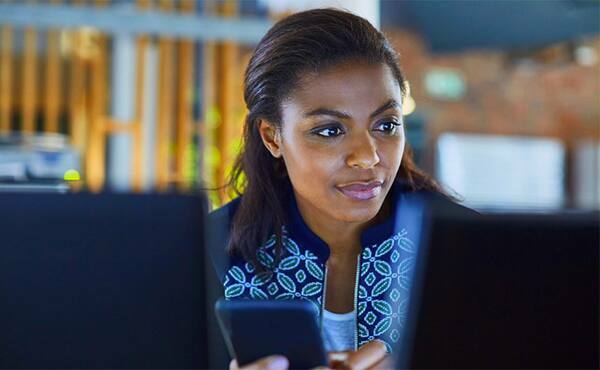 For more on the benefits of automation, read the IDC report The Business Value of Concur Invoice. “We’ve seen calls from vendors drop. This has created more value-added time for our customer service staff to take on more jobs"
Remove the margin of error with automation of manual tasks. Upgrade to mobile-ready systems, so AP functions are easy to access. Integrate your data streams for big-picture analysis. Read our 10-step guide to learn how you can make AP more efficient.